Producing cheap, carbon-free, and nearly unlimited energy through the process that powers the sun has remained an elusive goal for decades. The Massachusetts Institute of Technology is betting big on nuclear fusion, launching a commercial spinoff aimed at harnessing the long-elusive technology within 15 years. The new venture, dubbed Commonwealth Fusion Systems, is a bet that after more than half a century of work toward reproducing the same process that powers the sun, recent advances in superconductors can provide a final boost. The goal is to produce a relatively compact pilot reactor that produces more energy than it consumes within 15 years. CFS has already drawn $50 million in backing from the Italian energy firm Eni. Fusion works by forcing together two atoms of the hydrogen isotopes deuterium and tritium. If successfully reproduced on Earth, fusion could produce cheap, carbon-free, and nearly unlimited power without the waste or risk of a meltdown that makes people leery of today’s nuclear fission reactors, which split atoms to release energy. In practice, however, fusion is one of those technologies that’s always been a decade or two away. The most promising route uses a superheated plasma contained by a magnetic field in a donut-shaped chamber called a tokamak. The plasma has to be heated to temperatures over 150 million degrees Celsius (270 million degrees Fahrenheit) for the reaction to work, and the magnets used to contain that field have to be cooled to temperatures approaching those found in deep space. All that takes an enormous amount of energy, and so far, no one has managed to get more power out of a fusion reaction than it took to make it happen in the first place. The closest anyone has come to breaking even so far used 24 megawatts of power to produce 16 megawatts of fusion energy. But the performance of those experiments “improved dramatically” between the 1960s and around 2000, Martin Greenwald, deputy director of MIT’s Plasma Science and Fusion Center, told Seeker. And the development of high-temperature superconducting magnets since then may have put that break-even point within reach, he said. “The quality and production is still improving, but it’s now reached the point where what you can buy is good enough for the kind of high-performance magnets we want to build,” Greenwald said. Rich Hawryluk, the interim director of Princeton University’s Plasma Physics Laboratory, told Seeker that previous copper-coil electromagnets have limited the magnetic fields that researchers have been able to produce. Superconductors that can operate at higher temperatures may be able to produce a magnetic field twice as strong as their colder cousins, and MIT’s focus is “an exciting idea,” he said. MIT’s bet is that a higher-performance magnet can get engineers to the break-even point faster and cheaper than the today’s current leading effort, the 35-nation International Thermonuclear Experimental Reactor now under construction in southeastern France. ITER’s goal is to reach that goal by 2030, and work on the reactor passed the halfway mark in December — but the 23,000-ton tokamak and its supporting equipment take up a platform the size of dozens of soccer fields. The goal of the MIT spinoff is to prove within three years that the superconductors — a combination of copper oxide, barium, and the rare-earth element yttrium, applied in a thin film on strips of steel ribbon — can produce a more powerful magnetic field to contain the superheated plasma. At the same time, the company will work to design a more compact device that can produce a fusion reaction within that plasma. The energy released by that reaction will heat a surrounding “blanket” of fluid to temperatures of a few hundred degrees, which can then be used to produce steam to turn a turbine and generator, Greenwald said. 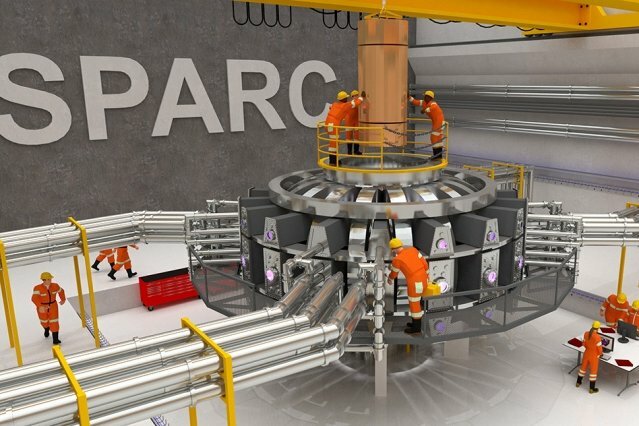 Hawryluk said fusion research has made steady progress over the last 30 years, which gave countries the confidence to go forward with the ITER project. Scientists have produced the kind of temperatures needed to create fusion reactions for more than 20 years. But he said the prospect of commercial fusion power depends on developing a device that could put in 10 or more times as much power as it takes to crank up. The timing may depend on how much governments are willing to open their wallets. The United States will contribute $122 million to ITER this year, and the Department of Energy and has been spending more than $400 million a year on fusion research in the last decade. But Hawryluk said those budgets have been flat in recent years and gone down in real terms since the 1980s, while other Japan, South Korea, and European governments have spent more. “I’ve been in this field for a while, and I find I am much better at predicting technical progress and really bad at predicting funding,” he said.